Not only do I like a touch of fall by the front door but I like that touch to extend to the back garden. 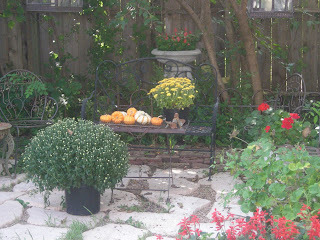 With a couple of mum plants and some pumpkins on a table, it feels like fall. 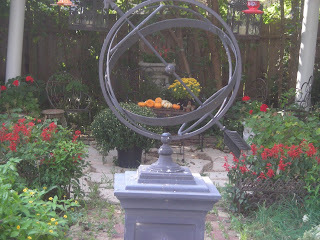 Of course, there are mums and asters blooming in the garden but I love that touch of orange that pumpkins bring to the garden. I tend, both front and back, to keep pot plants to shades of red or yellow for they can transition into fall while pink plants cannot! There is nothing like your pots full of annuals screaming summer while all around them are bronzy mums and orange pumpkins! I like the look of the big mum under the pergola. So much so that I may get a permanent pot to put there -- first for spring lettuces, then for summer annuals and then for a fall mum! Martha, if you are not by profession a decorator, you should be. You have a marvelous sense of color! Thank you, Mary -- no I'm not a decorator but I do love putting things together.